We recommend and sell Oma's Pride a complete line of prepared raw pet food products made expressly for those feeding raw diets to their pets. At Moriarty's DogTown, we believe proper nutrition is the foundation for pet health and well-being. A raw pet food diet reflects what your pet would eat in its natural habitat. Since dogs and cats are carnivores by nature, they thrive on a diet rich in nutritious meat. What are some of the benefits of feeding raw dog food versus commercial pet food? Healthier and shinier coats, less itching and scratching, less tartar build-up on teeth, sweeter breath, fewer digestive difficulties, more even temperament, fewer energy spikes, easier weight management, less runny eyes, smaller & less smelly stools and less gas. When you feed your dog a biologically appropriate raw diet, they will thrive. Raw meat and bones, along with a little bit of fruit and vegetables, were the diet nature intended for dogs - our furry family members. 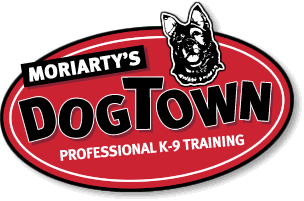 For more dog training information contact: Kevin M. Moriarty P.O. BOX 401 East Longmeadow, MA 01028 413-525-9888 Office 413-531-6165 Cell Or CLICK HERE to email the "Dog Man"